Porter Cable brings contractors the most advanced saw blade technology available with the launch of the new line of Razor Variable Tooth Carbide circular saw blades. These new Porter Cable saw blades are designed to meet all the contractor's cutting needs by providing accelerated cut speed, smoother cuts and more work life. Porter Cable Razor Variable Tooth Carbide saw blades also cut more quietly than conventional carbide blades, and require less effort from the user. Porter Cable achieved these benefits by combining series of fast-cutting teeth with series of smooth-cutting teeth. The two different series of teeth work in conjunction, allowing the blade to cut significantly faster and more cleanly than conventional blades, with a more productive work life. While Porter Cable's variable tooth saw blade design is new to consumer markets, it has an established and proven history in the industrial sector. This technology was developed in sawmills and high production factories to gain cutting speed, cleaner cut edges, less cut noise and longer life. Porter-Cable has improved upon this design and added several features to enhance all aspects of blade performance. These blades have a laser-cut plate for tighter tolerances and more precision, and are made of stronger, fully hardened and flattened steel for increased plate strength, more rigidity and less deflection. The thin kerf C3 micrograin tungsten carbide tips work tough and are razor-sharp. The tips are ground on state-of-the-art sharpeners with very tight tolerances held tooth to tooth. In addition, the asymmetrical tooth spacing disrupts the harmonics, so the blade cuts more quietly. Razor blades also have a new anti-kick tooth design that works as a raker tooth to clean the cut while preventing dangerous kickback. In Porter Cable testing against competitive 7 1/4" blades, the Razor Framer, on average, cut one and a half times faster, and provided one and a half times the work life. The increased speed allows the blade to cut with noticeably less effort than competitive blades. This benefit is also a plus for DIYers, as it makes it easier to cut straight lines. The new line of Porter Cable Razor Variable Tooth Carbide circular saw blades is manufactured in North Carolina by Oldham Saw. Oldham has been manufacturing saw blades since 1857. 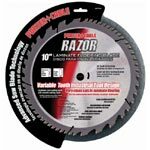 Razor Variable Tooth Carbide saw blades are available in 7 1/4", 10" and 12" diameters for use on portable saws, table saws and miter saws. One of the new Porter Cable Razor Blades is a true innovation - variable tooth carbide saw blade design combines series of fast-cutting teeth with series of smooth-cutting teeth. The two different series of teeth work in conjunction, allowing the blade to cut significantly faster and more cleanly than conventional blades, over a longer work life. Razor also provides quieter cutting and easier cutting - less effort required from user. Laser-cut plate - tight tolerances, more precision. Increased plate strength for more rigidity, less deflection. NEW anti-kick feature combines safety with a raker tooth that cleans the cut. C3 micrograin tungsten carbide tips - work tough, super sharp. Asymmetrical tooth spacing disrupts harmonics, so the porter cable saw blades produces less noise.